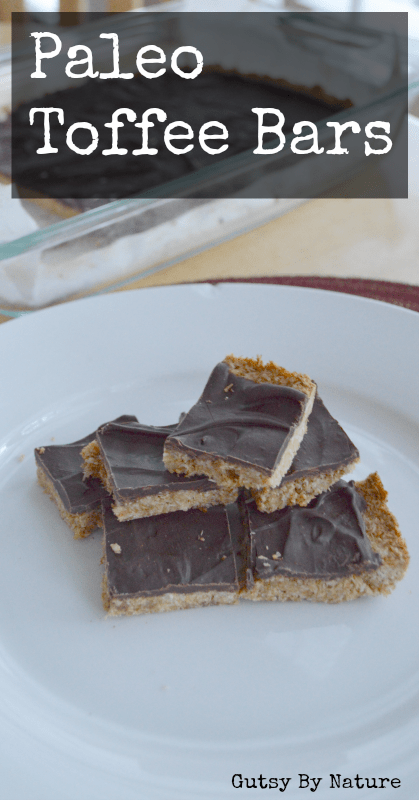 These paleo toffee bars are a grain and dairy free riff on one of my favorite Midwestern childhood treats – sweet and buttery chocolate toffee bars. The original recipe came from an old collection of collected recipes from my grandma’s homemaker’s club that we referred to as the “red cookbook” even after the book became so worn that the red cover fell off. This cookbook was a favorite in our house – loaded with the hearty meat and potatoes kind of meals both of my parents ate while growing up in Wisconsin and Minnesota and then fed to my sister and I, but the most used section was the one labeled “cookies and bars.” And because I’m a little bit lazy, when I was the one baking I usually gravitated toward the bars because once you finished mixing, all you had to do was spread the dough in a pan and stick it in the oven rather than tediously shaping cookies and rotating cookie sheets, etc. Incidentally, if the term “bar” as referring to a cookie-like dessert baked like a brownie is unfamiliar to you, then I bet you also wouldn’t know what to do if I asked you to bring a “hot dish” to a potluck or what to expect when I invited you to a “brat fry.” Those of us who were raised in the upper midwest have a whole secret language (beautifully captured in the hilarious book How to Talk Minnesotan) and even though I’ve lived elsewhere for almost 8 years now, I still slip up from time to time! On to the recipe… Simplicity is the key here. The original recipe is just a handful of ingredients and so is this paleo-ified version. Because I just don’t feel good when I eat larger quantities of nuts but seem to do well with coconut, I opted to avoid the paleo standard almond flour. On a hunch, I thought I could do this without any flour at all and it turns out I was right. Just two cups of unsweetened shredded coconut (that’s one whole bag of this brand – which I buy through Amazon’s subscribe and save program for an excellent price), a couple eggs, some coconut sugar (this is a good brand) – which nicely approximates the color and flavor of the brown sugar in my childhood original, coconut oil, some dairy and soy free chocolate chips (I used this brand), and a couple other ingredients. Here’s a little hint… If you are super impatient and don’t want to wait for the chocolate to re-harden, you can cut them while the chocolate is still melty and fold them into little toffee bar sandwiches. That’s how we ate them at least 50% of the time! 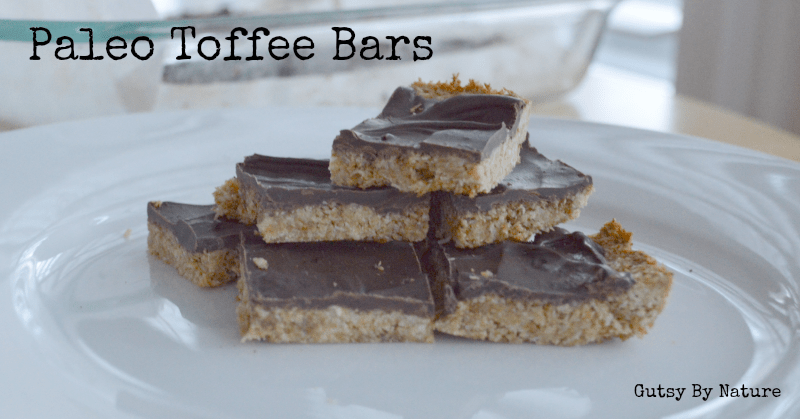 These paleo toffee bars recreate a childhood midwestern favorite but without any grain, dairy, or refined sugar. Line a 9X13 inch baking dish with parchment paper. Mix together coconut, coconut sugar, coconut oil, eggs, vanilla and salt. Press into baking dish evenly. Bake for 25-30 minutes, until set and lightly browned. Turn off oven, remove pan and sprinkle with chocolate chips. Return to oven for a few minutes so that chocolate chips can melt, then spread melted chips with a butter knife or offset spatula. Allow to cool so chocolate can re-harden. Cut into squares. Serve immediately or store in freezer. Shared on Gluten Free Fridays.